Switch that gas guzzler out for an electron-eating EV and the equation changes. 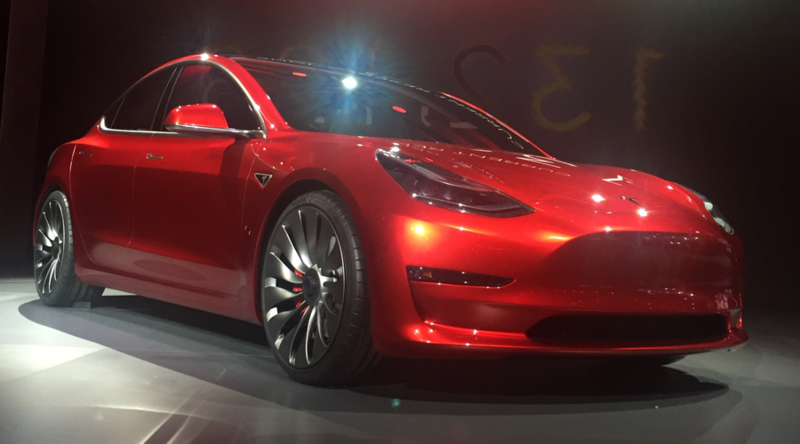 A Tesla Model S traveling the same distance would need power generated by about 2,500 cubic feet of natural gas, 286 pounds of coal or 33 minutes of blades spinning on a giant offshore wind turbine to make the same journey. 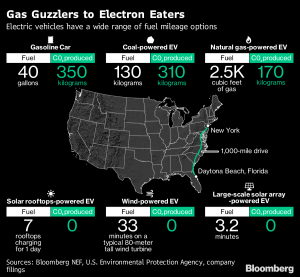 Taking that same 1,000-mile road trip in an electric vehicle that needs 33 kilowatt-hours of energy to travel 100 miles, like a Tesla Model S, would require about 286 pounds (130 kilograms) of coal to be burned at the local power plant. Modern coal plants only convert about 35 percent of the fuel’s energy into electricity, and about 10 percent of that electricity could be lost as it travels along power lines. Even with all those losses, the electric vehicle road trip is still better for the climate than driving a gasoline-powered car. Burning that much coal would release about 310 kilograms of carbon dioxide into the atmosphere, compared with 350 kilograms by the 40 gallons of gasoline. Even though coal tends to emit more pollutants than oil for the amount of energy it generates, the efficiency of the electric vehicle, which recharges its battery with every brake, more than makes up the difference. A natural gas power plant producing the same amount of electricity would need to burn about 2,500 cubic feet of the fuel, enough to fill a small apartment in Hong Kong or a master bedroom in Dallas. Gas plants are more efficient than coal, typically converting about half the fuel’s energy into electricity. It’s also much cleaner, emitting just 170 kilograms of carbon dioxide for the 1,000-mile journey. When it comes to charging electric vehicles with solar power, size matters. A typical 10-kilowatt rooftop array would need about seven days to create enough electricity for a 1,000-mile journey, as clouds and darkness mean it only operates at about 20 percent of its capacity on an average day. Scale up to a photovoltaic power station, though, and it would take a matter of minutes, not days. At a modest-sized solar field like the 25-megawatt DeSoto Next Generation Solar Center in Florida, the average daily output would produce enough electricity for a 1,000-mile drive in less than four minutes. Wind is a similar story, with different sizes of turbines producing different amounts of electricity. Take the Vestas V90-2.0 MW, an 80-meter tall behemoth that can be found swirling on the plains of West Texas, among other locations. Just one of these turbines, and wind farms are usually planted with dozens of them, produces enough electricity in a day to power a 1,000-mile trip every 33 minutes. Calculating carbon emissions from wind and solar is a bit trickier. Neither emit any carbon dioxide in the course of producing electricity on a daily basis. But unless they’re paired with adequate energy storage — and most existing renewable generation isn’t — carbon-emitting generation has to make up for them whenever the sun isn’t shining or the wind isn’t blowing.